The inaugural program Art on theMART, featuring work by four renowned contemporary artists, launched to rave reviews in Chicago Sept. 29. 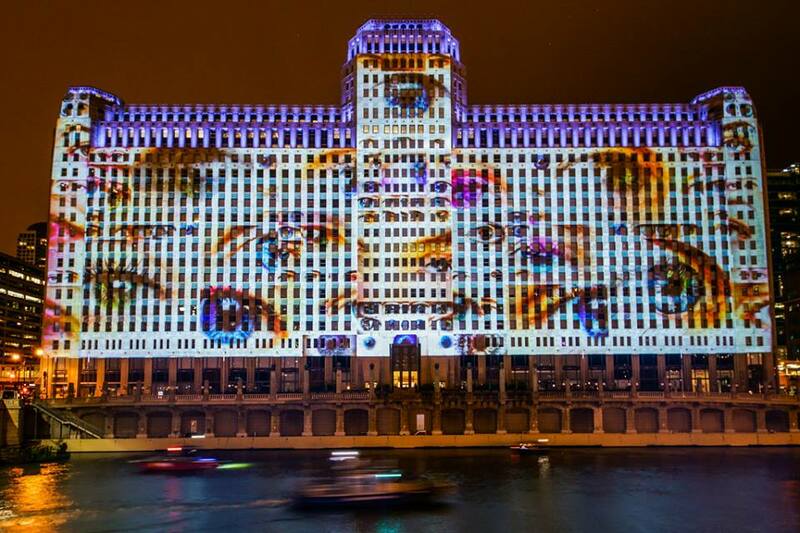 Representing the first of its kind in Chicago, it’s a curated series of digital artworks — utilizing 34 projectors and totaling nearly one million lumens — projected across 2.5 acres of theMART’s (formerly the Merchandise Mart) exterior façade along the Chicago River, creating the longest-running and largest permanent digital art projection in the entire world. The projections will be displayed up to two hours a night, beginning at dusk five nights a week (Wednesday-Sunday) from March-December and visible to the public from both Wacker Drive and along the Chicago Riverwalk. And theMART’s new software-driven platform will allow for curators to create an ongoing, timely and engaging exhibition of imagery from celebrated artists.